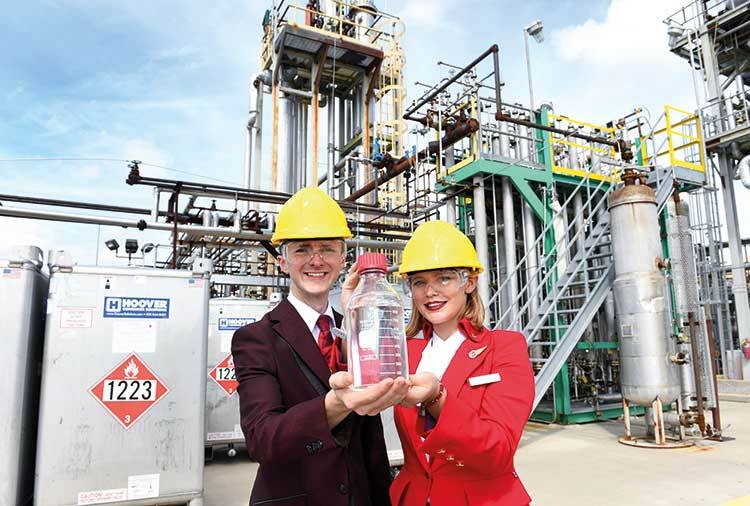 After boarding Virgin Atlantic’s first commercial flight using fuel partly made of recycled waste carbon gas – and touring the plant where it was made – Jennifer Morris reports on how this fuel is created and what it could mean for aviation. What some believed to be science fiction became a reality last week when Virgin Atlantic operated its first commercial flight using fuel made up in part from recycled waste industrial gas. The fuel used on the Boeing 747 travelling between Orlando and Gatwick on Tuesday, October 2, was a blend of traditional jet fuel (derived from fossil fuels) and the first batch of a new material made by US firm LanzaTech, known simply as “jet”, which itself is made via a two-stage process. While there is nothing new about airlines developing sustainable fuels, Virgin Atlantic believes LanzaTech’s product to be the most “commercially viable” option. Currently, a 50:50 combination of traditional jet fuel and jet is qualified for use in aircraft. For its first commercial flight using the mix, Virgin Atlantic opted to use just five tonnes – about 5% – but this “can be built up [towards the 50% limit] over a few flights”. 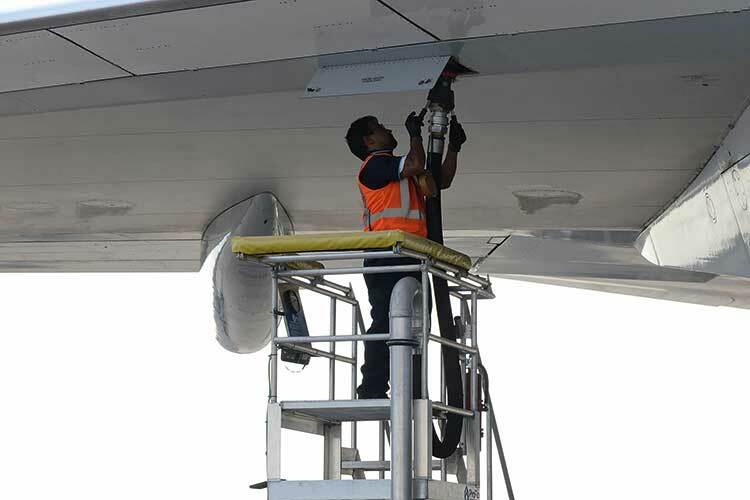 Airline manufacturers believe the proportion of LanzaTech fuel used for commercial flights could increase to 80-90%. Virgin Atlantic has been working with LanzaTech since 2011 on carbon capture and utilisation (CCU) technology that takes carbon-rich industrial waste gas from steel mills then recycles it into ethanol – gas that would otherwise be released into the atmosphere. The ethanol, in turn, can be used for a variety of low-carbon products, including jet. The waste gas is fed into a reactor and, in a process with similar principles to fermentation, LanzaTech adds microbes, which consume the gas and ferment it to produce ethanol. LanzaTech has an operational gas-to-ethanol site with a steel mill in China, opened in May. While the focus for LanzaTech so far has been on converting gas to ethanol, the next stage is scaling up the ethanol-to-jet conversion process, which was developed with US Department of Energy (DoE) laboratory Pacific Northwest National Laboratory. The DoE has been helping LanzaTech with this second wave of development. Two years ago, the former granted LanzaTech $4 million to enable the company to look at developing its American site in Freedom Pines, Georgia – which TTG visited last week – into a 10 million US gallon per year facility, taking sustainable raw material to make jet and diesel. It is hoped this will be up and running by the end of 2019, or the beginning of 2020. Meanwhile, LanzaTech is evaluating whether to use Department for Transport funding for a site in the UK that would produce 30 million US gallons of jet per year. The goal is to open this at the beginning of 2021. LanzaTech estimates its gas-to-ethanol process could be retrofitted to 65% of the world’s steel mills to produce nearly one-fifth of all aviation fuel used each year “at a commercially viable price”. While Virgin Atlantic does not have an equity involvement with the biotech firm, there is an understanding it will take the fuel as and when it is produced – provided it is “close to hand”. The airline is calling on the UK government for its help with the expansion. Speaking at a press conference in Orlando prior to the launch flight, Virgin Atlantic chief executive Craig Kreeger said: “From LanzaTech’s perspective, it may not matter where the next plant for this fuel is, but we definitely want it to be in the UK – that’s our base. We are urging the UK government to form some kind of partnership, whether it’s through incentives or otherwise, to try to encourage investment into the [UK] plant so we can have this fuel close to hand. Asked by TTG what he would say to those highlighting that recycling waste carbon still relies upon carbon being produced, Dave Meyer, LanzaTech senior business development manager, argued: “The waste gases from a steel mill are an obligate waste – it is just a natural by-product of the chemistry of the process. And while we need things like steel and cement, you’re going to have these emissions [anyway]. In a recent blog, Sir Richard Branson, founder of Virgin Group, said because it uses waste carbon, LanzaTech jet had the potential to achieve more than 70% lower carbon emissions compared to regular fossil jet, with “no land or food competition issues”. “Because it uses a plentiful, affordable waste stream, this is set to keep the fuel price competitive with that of traditional jet fuel,” he said. During a press conference at Gatwick, it was put to Branson, Kreeger and LanzaTech chief executive Jennifer Holmgren that if the qualification level remains 50% then the reduction in emissions will only be marginally greater than that provided by the latest aircraft, and that with the growth of the aviation industry this would not result in a big reduction in aviation’s contribution to emissions overall. Holmgren said: “These fuels have an [emissions] footprint in the order of a 70-80% reduction relative to conventional kerosene, so if you put in 50% or beyond that, you can have a significant impact. Branson highlighted that while there would be more aircraft in the future, there would also be more industrial plants. He added his belief that a breakthrough in battery technology was likely in the next five years “so you could have a situation where you use this fuel for take-off and landing and you use battery technology for flying across oceans”. Kreeger added: “We’re not saying that this is the only solution. There are others around the world working on alternative ways of producing sustainable jet fuel and we hope all those are successful. Holmgren agreed, adding: “It’s extremely important to let all solutions have a seat at the table. Holmgren told TTG she believed LanzaTech could “have a significant impact in the next seven years”. She said as soon as the company could de-risk the technology by building the new plant in the US it could replicate the model quickly. “We absolutely want to work with more airlines in the future – I think it’s a case of the rising tide carries all ships,” she added. And while Virgin Atlantic has “put all its eggs in one basket” with LanzaTech, it too is free “should another great opportunity come along” to find other solutions or purchase fuel from others. Branson reiterated his point that the help of the UK government was needed “to make this a reality”. “Carbon neutrality by 2050 is what we pledged [in the Paris climate talks] – today we can show that aviation may even beat some other industries in getting there if we can get these factories built as fast as possible around the world. However, it will be “another couple of years” before LanzaTech has sufficient fuel for the airline to have regular commercial flights.